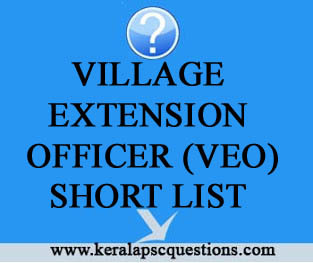 Thefollowing are the Register Numbers of candidates who are found provisionally eligible to be included in the Ranked list, subject to the verification of the Original documents, for selection to the post of VILLAGEEXTENSION OFFICER GRADE II on `9940-16580(PR)in Kasaragod District. (Category No. 504/2012)in RURALDEVELOPMENT DEPARTMENT onthe basis of the Objective Type Test (OMR)held on 21/06/2014.The Register Numbers are arranged on numerical sequence and the arrangementdoes not in any way, indicate respective rank of the candidates on the basis of marks secured in the OMR Test. Alphabet 'B' shall be prefixed to all register numbers to indicate Kasaragod District. The original documents to prove the Date of Birth, Community,Qualification etc. in respect of the candidates will be verified before the Ranked List is finalised and published. The date, time and venue fixed for verification of original documents will be intimated later. the candidate for inclusion in the Ranked List. (2)The Probability list is prepared based on the details furnished by the candidate in the application and subsequent claims made will not be entertained at any stage. of the Probability list. The requisite marks have been lowered to the extent necessary in respect of the Supplementary lists.